Tips for new bloggers! 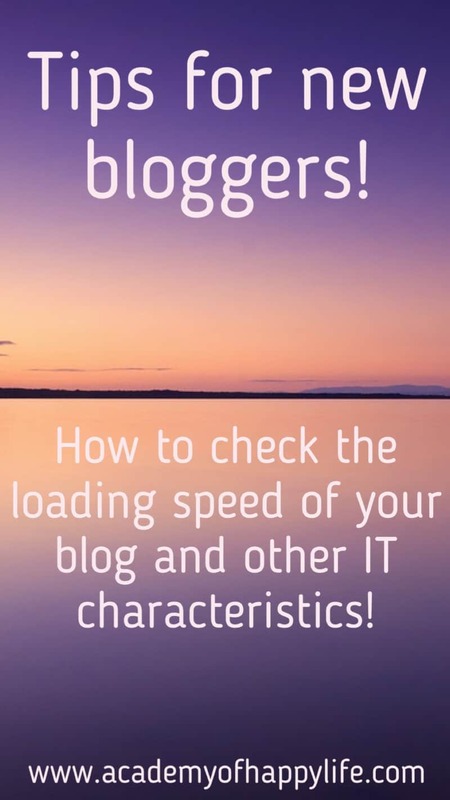 How to check the loading speed of your blog and other IT characteristics! In this article, we will be talking about the loading time and the most popular and important IT characteristics of websites, and how to check them. In other words, we will be talking about what is happening “behind the scenes” of your blog. You can see your blog visually as a reader, but you can’t see the actual organs of your blog. Don’t worry, it won’t be hard. I will show you the easiest way to scan your website and check all the information you need. Here’s how I found out about it and why it is important. When I started blogging, I knew nothing about these things. I read a couple of articles where “professional” and successful bloggers recommend readers just to start their blog now by clicking on a link to buy hosting and become successful as they are. It sounded so easy and so promising. When I started my blogging journey, I found that it was not as easy and simple as I thought. First, my website was loading too slowly. As you know, one of the most important factors is the loading speed of your blog. Per statistics, if your page takes longer than 4 seconds to load, you might start losing readers and audience. Loading time is very important. It can depend on a lot of factors, the most popular is the response time of your server. Check how much time it takes your website to load. We will talk about it a bit later and I will teach you how to check it. Other reasons can be a poorly coded theme, not optimized images, a lot of images and videos per one page, poorly coded plugins, etc. But how to check the loading speed of the page? Just open your pages and count how many seconds it takes to load? I had the same questions in my head. Oh yes, I thought I should do it this way in the beginning, and I did it for a couple of times. Yes funny, but I didn’t know that some analyzing tools exist. After searching different resources, I coincidentally found a couple of websites which provide a free scanning of your blog. After scanning your blog there, you receive a fully detailed report on what is happening “behind the scenes” in your blog. In this article, I will share with you the most popular scanning tools, which I am using on a regular basis for my blog. My favorite tool is GTmetrix. As you can see, it is a very popular website, which analyzed more than 222 million blogs so far. It is a very good scanning tool, and the most important is that it is totally free. You can use it as many times as you want. 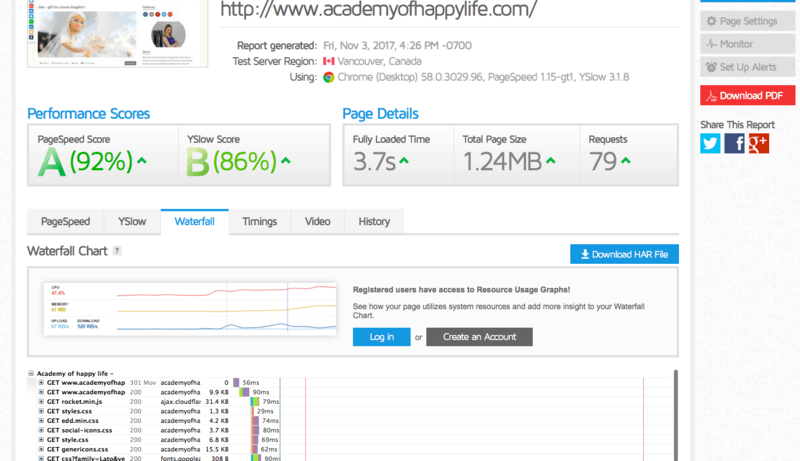 After entering your information, you will see a full report on your blog’s performance. Ideally, all fields should be green and at 100%. But in all active blogs, it is almost impossible. For every blog that runs advertisements, every ad you add to your blog will make it slower and bring your blog scores down. Even some plugins and some themes might make it worst too. Actually, I noticed it so many times. If a plugin brings your characteristics and your scores down, it will also slow down your loading speed. 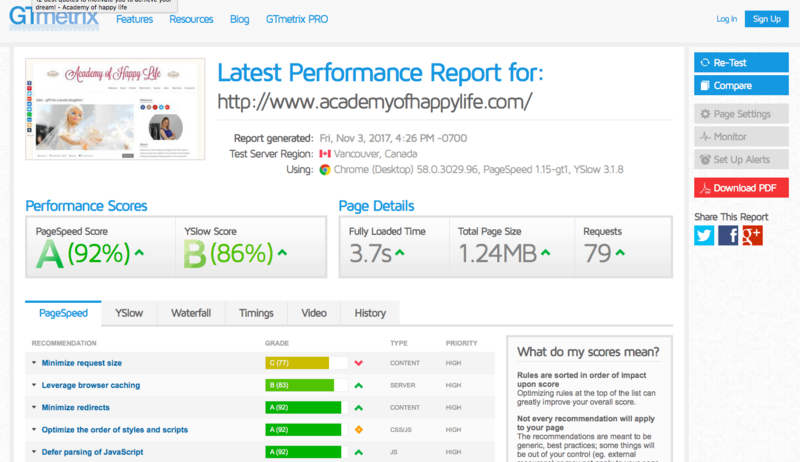 After scanning your blog, you will get a detailed performance report similar to the above. If everything is in the green zone and the ‘fully loaded time’ is up to 4 seconds, Congratulations!!! You manage your blog very well. If not – you need to work on your website and get it “healthier”. When I scanned my blog for the first time, the results were awful. The loading speed was more than 43 seconds, all characteristics were in the red and orange zones, I was so shocked. I thought I need to start taking more care of my blog. When do you need to scan your blog? A plugin is like a pill that should fix your problems, but just like any pill, it might have some “side effects”. For some blogs, the “side effects” will be minimal, because they have very strong “immunity” (for example they use a very well coded theme). Usually, for the most popular functions, you can find a couple of similar plugins. 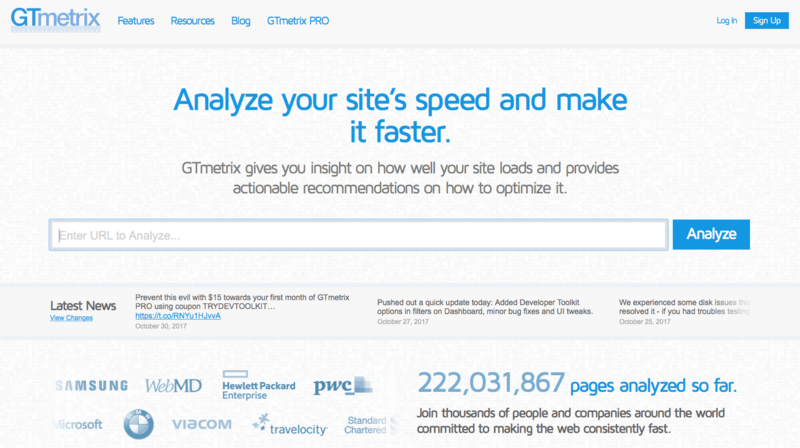 Just choose the best for you and test it every time with GTmetrix to see how it works on your website. For me, to install Google analytics plugin with minimum “side effects”, I had to try 5 different plugins. Suggestion: if you are planning to change your WP theme, just scan the demo version of the theme you are planning to install and you will have some idea on how it is coded and how your website will be performing with it. 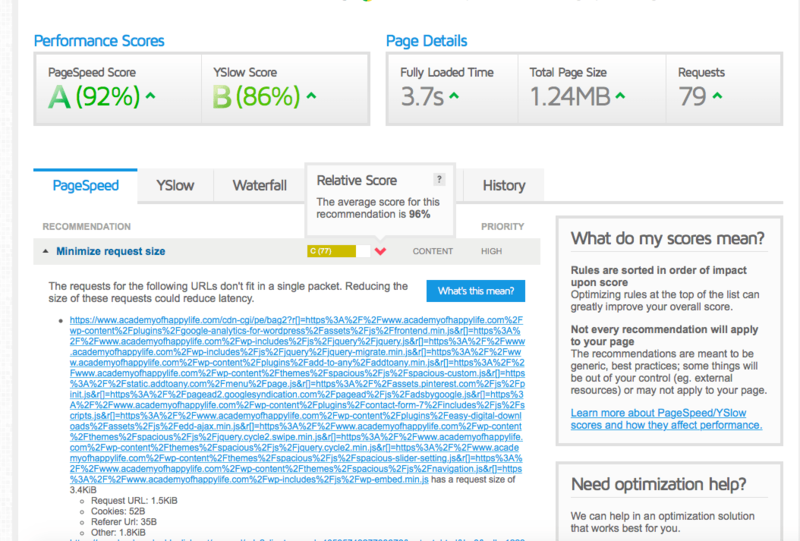 Scan your website if you added new ads, so often it affects your scores. Even after adding a new post to your blog, it is recommended to scan your blog. One of the reasons is that some of your photos might not be optimized correctly, so you can fix it. How to know what do I need to fix? This is the easiest question. Just press on the small symbol at the right side of the percentage button and you will know which files are causing this problem for you, then work on them. How to check my loading speed? As you can see at the top left side of the screenshot above, your website loading time is the ‘Fully Loaded Time’, which is 3.7 seconds in my case. If you are running ads on your blog, the same as I am doing, you should know that this time will fluctuate. The reason for the non-consistent loading time is that the server needs to load your information and the information from the ads server too, so it takes longer and the loading time can vary sometimes. If you can see that you are in the range, which is around 4 seconds or less, then your website is fine. For example, if I deactivate my ads, my ‘fully loaded speed’ is around 2.3 seconds in average. It is very important to expect your loading time to be slower if you want to run a couple of different ad types on your blog. In this photo above, you can check how much time it takes to get the information from your server. Remember, your server is located at your hosting company, and the company is responsible for the speed of your server. A good hosting company is very important. I previously had some bad experience with another hosting company, other than the one that I use now, and my experience was horrible and the loading speed was awful. Just remember, the first line is the response from your server. In my case, it took 0.56 milliseconds to get the information from my server, which is very good. All the other timings are the time it takes to load the posts, photos, and ads. Checking the speed and the response time of your server in the hosting company may give you an idea on how to improve your speed. In my case, I had to change the hosting company and it totally solved my problems. You can see the good results now. I am currently using Siteground, and I am very happy with their products, services, and support. A lot of people suggest Pingdom to scan blogs. I tried it, it even gives a more detailed report, but I find it more complicated. You can try both and scan your blog and see which one you like more. Please feel free to share your experience and your scanning results with us in the comments below. I am a blogger, and if you are reading this article, then most probably you are also a blogger. Let’s keep in touch through social media messengers. You can find links to my social media accounts here. Join my network and let’s connect. How to check if your website has any malware or viruses and how to fix it! ← Joke – a smart wife! Great tutorial and to tell you the truth, I really don’t pay enough attention to my blog speed. I know that it’s important especially for SEO. But as bloggers, there’s always something that we need to be working on. Maybe I’ll use your tutorial and spend some time checking and improving my blog load speed. I’ve been meaning to do this, thanks for the reminder. I also love using GT Metrix whenever I check my load speed. Thank you for your comment, Susan. Totally agree with you, in blogging you never feel that you did enough. Every time needs to learn something and implement new tools and ideas. It is very easy, beleive me if I could do it, you can do it too. It is so important to keep your website in a good shape. First of all the loading speed will be fast. If you will hve more questions, feel free to ask. Hey ! nice article….. It is very much useful to new bloggers. This is some great information. I wish I had this info sooner. Going to try this right now! My blog is doing all sorts of dunking things right now so I’m curious to see how my blog is rated! Good luck! Share with me your result. Maybe I can suggest you anything. That is a great tip! Going to go check out my own site now, thanks! Thanks for this, it’s interesting, my results definitely need some improving. Which is good now I can work out what to focus on next. Thank you for your comment! Now you know a great tool with which you can check your website totally for free. This is super interesting to read this! I’m still so confused about running a blog. I have so much still to learn. Few bloggers realize just how important blog load speed is! It factors into SEO. I recently had to take a hard look at why my blog was so slow. Oh yes, the loading time is very important! Totally agree with you! Before I started blogging, I didn’t realize there were so many things one has to take into account. Thanks for this. Thanks for recommending this tool, didn’t know about it. I run a scan on my blog; the results are not terrible but there is definitely room for improvement. I will definitely look into it a bit more and make some changes.